Egyptian military mounts what is reportedly the largest operation in Sinai since 1973. The Egyptian military is mounting what is reportedly its largest operation in the Sinai Peninsula since the 1973 Yom Kippur War – as part of a struggle against islamist terrorists. At least 30 people are said to have been killed in the operation, which began Saturday morning. According to the Bethlehem-based Maan news agency, military helicopters targeted arms depots and army forces took control of communications centers. The operation was intended "to clean out the towns of Rafah and Sheikh Zweid of dangerous terrorists," an official Egyptian military source said earlier in the day. Sources inside the military told Al Jazeera that the attack began with aircraft firing rockets at terrorist hotbeds, and that this was followed up with a ground assault by soldiers on the terrorists. A witness described a large column of tanks, trucks carrying infantry, rocket launchers and other military vehicles on the road Saturday. 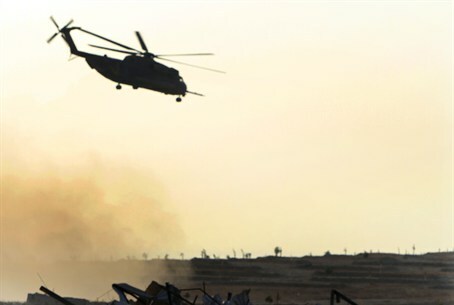 On Tuesday, four Egyptian military Apache helicopters fired missiles at terrorist targets in the Sinai, reportedly killing 15 people. The attack included the firing of 13 missiles at the homes and vehicles that serve terror suspects.